Info: Split of two musical genres. PARANOIA INDUCTA - known Polish industrial project with uncommon sounds and mechanical rhytms. KENJI SIRATORI - Japanese extermist involves in world of cyber, noise, industrial and punk music. The surprising album that they made together is a grim dark ambient, with lot of Japanese culture infuences, instruments and sounds. Filled with songs made by Kenji in his native language. Cold soundscapes filled with soul of Japanese warrior give this album unique feel! Customer evaluation for "Paranoia Inducta feat. 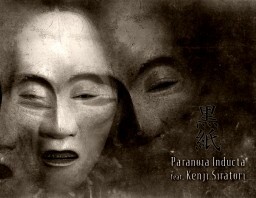 Kenji Siratori - Blackpaper CD"